Ants vs Termites, What Do Termites Look Like. We would be happy to identify any pest you may have. We offer Free Termite Inspections in New York NY, Westchester County NY, Rockland County NY and Orange County NY. Don't let Termites Destroy your home. Give Us A Call Today. 1-844-305-8999. 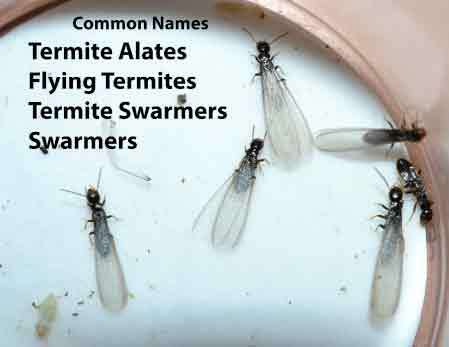 Entomologists refer to winged ants and termites as alates. The alate is an adult, sexually mature stage in the ant or termite life cycle. Alates develop in the colony from immature stages prior to the flight season. When the alates receive the proper cues (warm temperatures, bright sunlight, low winds) they will leave the colony and fly away to start their own colonies. The exodus of alates from a colony, known as a dispersal nuptial flight, is commonly referred to as swarming; so alates are often referred to as swarmers. Male and female termites shed their wings and will pair up when a suitable mate is found. Then they will search for a suitably damp piece of wood or soil where they will start their new colony. When termites swarm they are often incorrectly identified as "flying ants". This is a common mistake because termite alates look very much like ants. There are three distinct differences that distinguish an ant from a termite. If you suspect you have ants or termites give our Termite Exterminators a call at 1-844-305-8999. At Dependable Exterminating we specialize in termite removal and extermination. Termites are frequently mistaken as ants. However, termites differ greatly from ants in terms of their appearance and characteristics as well as their food preference. Termites live on a strict diet of cellulose. Cellulose is an organic compound found in wood and plants. All species of termites live off cellulose, meaning that they not only consume wooden structures, but they can and will also feed on plants, cardboard, and paper. Although very similar to ants in terms of shape and size, termites have unique features which help when identifying them. 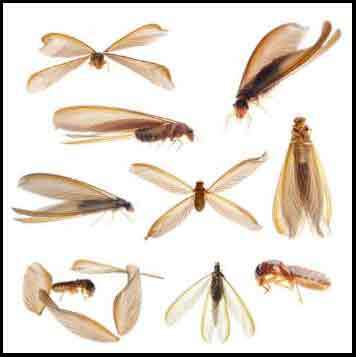 - Termites are a light color (typically white or cream). They sometimes appear to seem translucent. - Termites usually have straight antennae’s, whereas ants appear to be elbowed. - Termites tend to have a thicker waist than ants. Ants also have their own set of unique characteristics which distinguish them from termites. Ants will often travel a great distance when it comes to searching for food. Some types of ants will lay down a scent which will attract other ants to a food source. - Ants are usually a darker color (depending on the species). - Ants have elbowed antennae, whereas termites have a straight antenna. - Ants have eyes that appear evident on either side of their head. 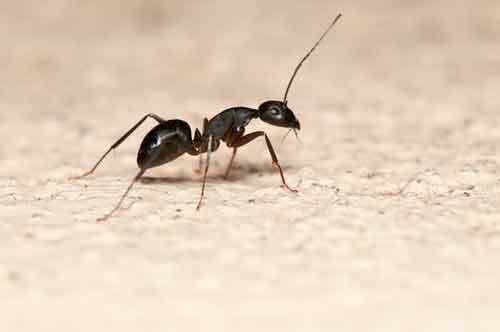 If you suspect you have Ants give our Ant Exterminators a call at 1-844-305-8999. We specialize in all kinds of Ant removals and extermination.